Promotion offers Samsung consumers the chance to win a trip to the Maldives JOHANNESBURG, South Africa – 31 August, 2016 – The majority of South Africans are thankful to note that winter is finally coming to an end and that they can once again get ready to unpack their shorts and sandals. Samsung Electronics South Africa shares this sentiment and has therefore decided to offer consumers a chance to get into the spirit of summer. The company is launching its ‘Kick Start Your Summer’ competition on the 1st of September 2016. Scheduled to run until 30th September 2016; the initiative will see 15 lucky winners win the trip of a lifetime to the beautiful islands of the Maldives. “Entering the competition is quite easy”, says Michael McKechnie, Director of Digital Appliances Group at Samsung Electronics SA. “Consumers simply need to purchase any qualifying Samsung air conditioning product through a recognised retailer, send the unique product serial number to the competition hotline via SMS and wait to see if they are one of the lucky names drawn at the end of the competition. Winners will be drawn on 14 October 2016 and proof of purchase, as well as the serial number will be required to validate wins” he explains. Once validated, the customer will receive an SMS with a winning pin code and the concierge service number to call to book their trips to the island. “The good news for customers is that this is just the first of a number of exciting promotions planned by Samsung over the course of the coming months,” McKechnie adds. “While a number of Samsung products qualify as entry to the competition, the start of the summer season is an ideal time to consider buying an air-conditioner. What better way to kick start your summer than by purchasing a product that could set you up with a dream ticket to the Indian Ocean paradise of the Maldives? So, if you are in the market for an air-conditioner this summer, then look no further than Samsung’s beautifully . . .
Samsung Electronics South Africa announced the launch of the Digital Variable Multi (DVM S) Eco 14 HP, a new side discharge variable refrigerant flow (VRF) air conditioner that is engineered to deliver a single outdoor unit solution for apartments and office buildings. The improved performance of the Samsung DVM S Eco 14 HP ensures that it meets the increasing market need for a specialised single outdoor unit to reduce the cost of previous multiple loading and sub-duct installation in multi-room buildings. The innovative design of the DVM S Eco 14 HP features a robust Inverter Scroll Compressor and corrugate fin, which improves heating performance by 20 percent and increases air flow by 10 percent compared to standard side discharge VRF units. "Research and development (R&D), as well as design, play key roles in how we develop our products as we're always focused on delivering cutting-edge technology and ensuring the products we deliver are highly efficient," said Michael McKechnie, Director Digital Appliances Group at Samsung Electronics SA. "The DVM S Eco 14 HP delivers unbeatable performance among the side discharge VRF units and does so with the greatest energy efficiency, as well as the best use of space, with its unique compact design." Single Solution for Multi-room Buildings The increased horse power of the DVM S Eco (maximum 14 HP) means that only one single outdoor unit is needed to manage the air conditioning requirements for an apartment or office building, in place of multiple costly units. All areas of the building are covered as the new unit also provides an extended piping length of up to 160 meters and an installation height of up to 50 meters. The width of the new DVM S Eco 14 HP is less than one meter (940 mm), maximising capacity and using space more efficiently, while the four-way piping enables convenient installation. Greater Energy Efficiency The design of the Inverter Scroll Compressor in the DVM S Eco 14 HP has . . .
Samsung Electronics Co., Ltd., the number one TV manufacturer worldwide for the past 10 years, recently unveiled its spectacular new line-up of SUHD TVs, ushering in a new decade of global TV leadership. Samsung’s 2016 SUHD TVs offer unparalleled picture quality with Quantum dot display, the world’s first bezel-less curved design. The TVs are beautiful from every angle and offer the smartest user experience, making it easy for consumers to access all their entertainment content in one place. In addition, the full 2016 SUHD TV lineup comes with IoT hub technology which allows the TV itself to control the entire smart home system. “Our new SUHD TVs represent our singular focus on innovation that matters most to consumers, by providing the very best picture quality for the home,” said Matthew Thackrah, Deputy Managing Director and Head of Consumer Electronics at Samsung Electronics South Africa. “In 2016, we’re going beyond anything we’ve done before to offer a remarkable synergy of design, engineering and craftsmanship.” Samsung SUHD TV with Quantum dot display: Unbeatable Picture Quality Samsung’s 2016 SUHD TVs feature the world’s only cadmium-free, 10-bit Quantum dot display, offering remarkable true-to-life picture quality, with stunning brightness, exceptional contrast and the most lifelike colours ever offered by Samsung. According to a recent consumer survey in the US*, the vast majority of consumers watches TV with light in the room (86 percent on a typical weekday, 85 percent on weekends) and only a small share say they watch in complete darkness (14 percent on weekdays and 15 percent on weekends). Samsung designed its new SUHD TVs to deliver the optimum viewing experience, regardless of the lighting environment. This year, all of the Samsung SUHD TVs will feature the ability to provide a premium high dynamic range (HDR) experience, with 1,000 nit HDR minimum for a higher level of contrast between light and dark images. New Ultra Black . . . It was mission accomplished for Team Telkom's Nolan Hoffman as he took the honours in an exciting sprint finish in the Bestmed Cycle4Cansa Road Classic at Sun City today. The 31-year-old professional from the West Rand in Johannesburg timed his finishing burst perfectly with about 80m to go to edge out Team Luso's Calvin Beneke and RoadCover's Bradley Potgieter in 2:18:13. In what the former Franschhoek resident described as a dream scenario, a small breakaway formed in the early stages of the 103km feature race in which all the pro teams were represented. "The racing in the first 10km was pretty aggressive and the breakaway group formed about five kilometres later," said Hoffman. "HB Kruger and I were there for Telkom and as I was the fastest out of the group it made sense for us to drive it. "Within about 10km the gap went out to three minutes and then to seven. Once we got that lead the guys in the big group behind sort of gave up." Hoffman said he knew he had to time his sprint perfectly coming into the finish. "HB was pulling for me and I knew I had to wait to take the sprint as late as possible. "I think Bradley got a bit nervous and he jumped first with about 250 metres to go. It was into a headwind and if you have been in a breakaway the whole race you will blow up if don't time it correctly. "I got on to his wheel and with about 80 metres to go I jumped past him to take the win." The former Cape Town Cycle Tour champion said he was "really happy" with the outcome, not having had much success in the Sun City race in recent years. "It's one of my favourite races and to get a win here is fantastic. "It puts the confidence up and I'm so happy for the team. The boys rode perfectly and it's always nice to reward them with a win." Hoffman said with the Bestmed Cycle4Cansa Road Classic falling at the back-end of winter and therefore affecting training, it was often a nervous race. He also got married this year which, he said, . . .
Bakwena Platinum Corridor Concessionaire, operator of the N1N4 highway, has again teamed up with PinkDrive Breast Cancer Initiative and the Department of Health to launch an awareness campaign for breast, testicular and prostate cancer among various communities along the N1N4 route. Charmaine van Wyk, Bakwena public relations manager, explains the motive for the campaign this Women’s Month: “Statistics on breast cancer in particular are a growing concern, and this is often due to inadequate education and lack of facilities being available in some communities. The need for early detection is enormous, which is why we are supporting PinkDrive’s message of ‘Early Detection Saves Lives’.” PinkDrive has educated over 30 000 women, provided over 19,000 self-examinations and have carried out over 4,000 free mammograms. Following Bakwena’s hugely successful campaign during 2015 in the far west when it covered the areas of Dinokana, Lehurutshe, Zeerust, Groot Marico and Swartruggens, the current Bakwena/PinkDrive campaign launches in the North West at Majakaneng Clinic on Monday and Tuesday (15th & 16th August), Bapong Health Clinic on Wednesday and Thursday (17th & 18th) and Friday (19th) at the Modderspruit Clinic. The campaign then moves on to Hammanskraal, at Jubilee Gateway Clinic (29th August), Kekana Gardens (30th), Ramotse Clinic (31st), Temba Clinic (1st September) and Mandisa Xiceka Clinic on 2nd September. “The campaign covers extensive education on the various types of cancers, early lump detection and clinical examinations. Caregivers from the community are also invited prior to the start of the campaign to attend the training that is provided by the PinkDrive nurses, in order to equip them with knowledge of the importance of early detection, and to ensure the education is carried far and wide after the campaign. “Learners from the high schools in the area are also included in the education around early detection,” says Van Wyk. CLICK . . .
Microwaves take the chill and effort out of cooking in the colder season With weeks of gloomy winter weather ahead, Samsung suggests you look to your microwave oven to help keep your family warm and comfortable. Michael McKechnie, Director: Digital Appliance Group at Samsung South Africa, points out that the microwave is by far the quickest way to prepare delicious meals, nourishing soups and steaming hot beverages. “The microwave is not just for reheating or defrosting. It reduces the time needed to prepare hearty winter comfort food, hot beverages and even modern-day hot water bottles,” he says. “Most people have access to a microwave, but they tend to just use it for heating and defrosting food. The fact is, you are able to use your microwave to bake, roast, boil, steam and even air fry food in a fraction of the time it would take using a stove. Busy professionals and hard-working parents could be turning out wholesome home cooked meals in minutes, using just a bit of imagination and their microwaves,” McKechnie continues. Not only does microwave cooking drastically lessen the time needed to prepare meals, it retains the nutrients in vegetables more effectively than many other cooking methods. Thanks to Samsung technology innovations like smart sensors, Slim Fry technology and convection fans, today’s microwaves produce virtually instant meals cooked to perfection, with just the right amount of crispness and browning on the outside, while ensuring a delicious and juicy inside. Samsung’s offers some hot tips for using your microwave to take the edge off the winter chill: Use your microwave to heat grain-filled warming packs to safely warm beds without having to resort to electric blankets. Microwave neck and back warmers, gloves and slippers can also be quickly heated in the microwave to keep the whole family cozy on the coldest winter’s night. Make old-fashioned cocoa as rich and chocolatey as you like – without any mess – by heating milk . . . 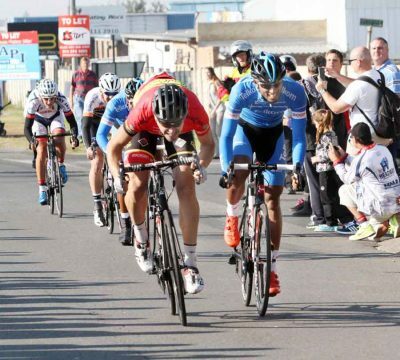 Already a multiple winner this season, Team RoadCover's Bradley Potgieter is looking forward to another strong showing at the Bestmed Cycle4Cansa Classic at Sun City on August 21. Although the 27-year-old from Wilgeheuwel in Johannesburg has enjoyed personal success, he said professional racing evolved around the team's objectives. "The big highlight was Clint (Hendricks) winning the Cape Town Cycle Tour this year," said Potgieter, who learnt his trade while growing up in Pietermaritzburg. "That was a major boost for a small team such as ours, plus I had quite a nice winning spree at the Emperors Palace Classic and Tour Durban. "But what I'm happier about is that out of our six riders, five of us have won races this year. "It just shows that the team has nice depth and you can always count on your team-mates to pull the slack if there is a bit of a squeeze." RoadCover will go into the 103km feature road race with confidence after Potgieter's sprint victory at Emperors on a similarly fast course. "Our preparation has been going well, but obviously we have just had winter so it's been a bit challenging to train properly in the cold." 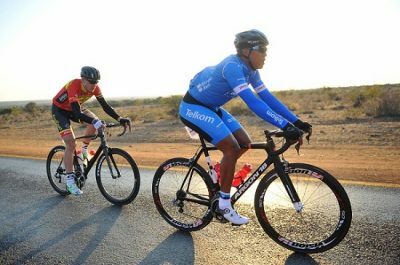 He said team management had supported them well by sending them to both the Jock and Lowveld tours in the lead-up to the Bestmed Cycle4Cansa Classic. "Those races have helped to get us in form for Sun City," he said, while reiterating that they couldn't afford to be over confident. He added that the nature of the conditions meant it would be an open race, with a number of riders capable of winning. "I have been the lead-out man on several occasions in this event, ending in success, but there can be nervous times because it is so fast and flat and there are no real opportunities to break it up. "So you find guys getting involved in the front of the race who are not normally there and that brings a bit more tension into the bunch. It's just a matter of trying to keep calm in the closing stages." With . 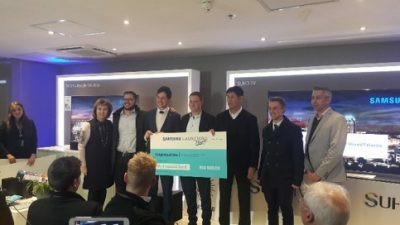 . .
Samsung Electronics South Africa is proud to announce that three exceptional young entrepreneurs have triumphed in the company’s Launching People - Mixed Talents competition. Last week, ten finalists undertook a ‘Dragon’s Den’ style grilling at the hands of six judges, to determine the winners, who received funding as well as other business support tools and services. After undergoing a series of pitching their various concepts to the judges - Michelle Potgieter, Director for Brand and Communications at Samsung South Africa; Lisa Illingworth, Entrepreneurial Host and Journalist at Hot 91.9 FM; Ian Wright, Founder of METIME; GG van Rooyen, Deputy Editor of Entrepreneur Magazine; Fahmeeda Cassim-Surtee, Director of DStv Sales and Marketing; as well as Garth Gaffley, Owner of Garth Gaffley Consulting and Mixed Talents – three winners were ultimately chosen. Kyle Dodds’ Cognition Online, which has developed an application designed for the tutoring industry and enables tutors, parents and students connect was the first winner announced. They were followed by Neo Hutiri’s Technovera Lockers, a smart locker designed to enable chronic patients to obtain their medicines securely, without having to wait in queues. The final winner was a mobile child safety seat designed by Trenton Carr. According to Potgieter, the Mixed Talents initiative was born of a desire to have a positive impact on the high youth unemployment rate in the country. “The Mixed Talents competition and Ideas Bank tool were designed to provide entrepreneurial youngsters with a forum to adequately express their ideas. Part of the global Samsung Launching People initiative, Mixed Talents offers local South African millennials a platform through which they can turn their entrepreneurial ideas into a reality. The ultimate goal is to make a real impact in youth unemployment in South Africa,” she says. The three winners will each receive R50 000 in start-up capital, as well as access to over R . . .
JOHANNESBURG, South Africa – 11 August, 2016 – Samsung Electronics South Africa is a fervent supporter of the Olympic Games and in particular, the ethos behind the global sporting event, which aims to encourage athletes to strive and to accomplish the exceptional. The competitors in the games are the elite that their respective nations produced, which means that those who stand at the top of the podium and receive gold are the leaders in their fields. These sportsmen and women never settle for anything less than being number one and are constantly striving to better their previous successes. A good example of this is South Africa’s own Olympic gold medalist, Cameron van der Burgh, who took the 100-metre breaststroke gold medal at the 2012 Olympic Games, setting a new world record with this feat. Despite his accomplishments on the ultimate stage, he has since gone on to win numerous World Championship medals and has twice won the Fédération Internationale de Natation (FINA) overall World Cup. It is this intense desire to always be the best and to continue triumphing in every contest he undertakes that makes him a truly extraordinary athlete. 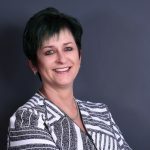 “We are proud to name Cameron as our brand ambassador as he is focused, driven and precise, constantly setting standards of excellence and quality,” says Michelle Potgieter, Director for Brand and Communications at Samsung South Africa. Like the top athletes, explains Potgieter, these are traits that the Samsung brand shares and it too is driven to be a winner. 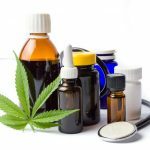 For this reason, when customers purchase its products, they know that they are obtaining the gold standard and the best of the best. “Samsung has a long history with the Olympic Games and our mobile business is a global sponsor at the Rio 2016 Games. As part of our Olympic commitment, we want to give every Samsung customer a chance to experience their own version of Olympic success with our ‘Go For Gold’ promotion.” Customers purchasing any Samsung . . .
Johannesburg, South Africa - August 2016: BetterMan is the new kid on the block, but has quickly matured to become the perfect gentleman. Quietly creating an exciting meeting place where brands and companies can connect with a targeted group of men. Since inception in 2014, growth has been rapid. 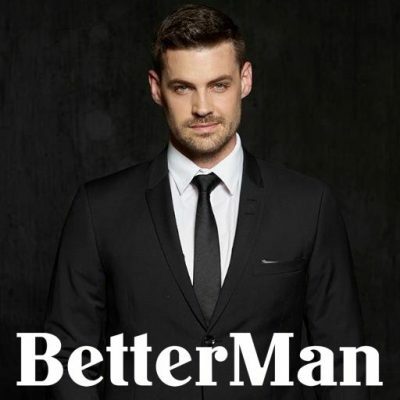 The BetterMan Facebook page currently eclipses the pages of some of the most well known South African men’s magazines with over 47 000 followers. The daily email is sent out to a dedicated database of more than 12,000 men. The BetterMan mission is simple: To make men unstoppable. This is done by putting the community first and providing them with qualitative, tailored and relevant content that goes beyond boring click bait articles. “BetterMan is seen as the trustworthy friend and cool big brother, it is also the influencer they admire and the role model they are looking up to, “says Erik Kruger, Founder of BetterMan. “Now we want to offer brands and companies the opportunity to get involved and to to connect with our very targeted and engaged group of men in various ways.” BetterMan offers tailored made solutions for every clients’ needs including: sponsoring of e-mailers delivered directly to the loyal BetterMan followers’ inbox; digitorials, client surveys and brand experiences, posts on the social media platforms; sponsored podcasts or webisodes; and custom-made experiential events hosted for the specified target market. BetterMan is about becoming a better man every day. In any way. No matter how small. In the way you act, speak, and live your life. Being a gentleman has become synonymous with the BetterMan life. The typical BetterMan reader is between 25-34 and describes himself as driven, ambitious, motivated, and determined. It’s clear that men who gravitate towards Betterman do so, because they want to rise above mediocrity. A glimpse of the BetterMan platform (30 June 2016): Website Page views per month: 13 000 Facebook Page . . .